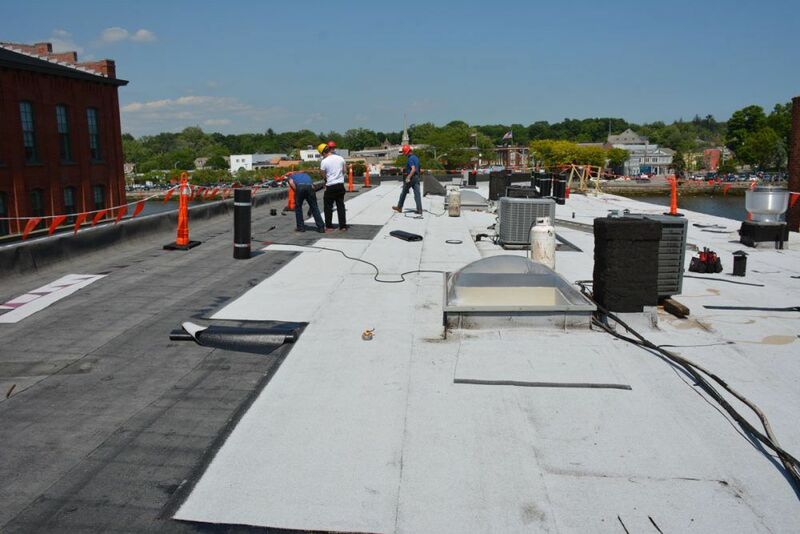 We specialize in the Installation of a Two-Ply Rubber Roofing System. This system comprises of 2 layers of Modified Bitumen Torch Down Rubber Membranes that are fused together. 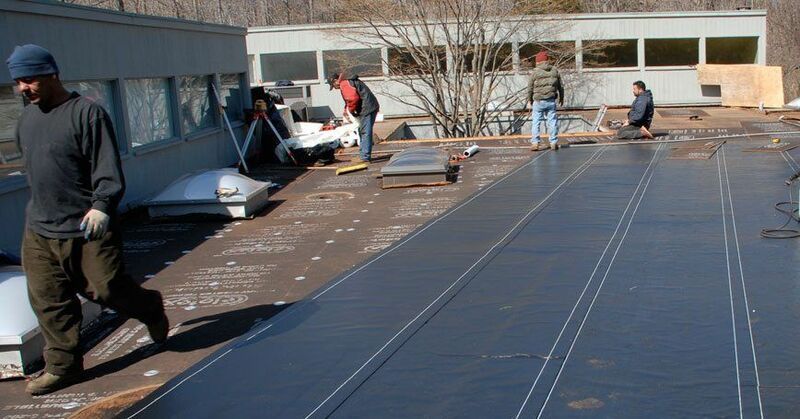 By adding a second layer, it makes this type of roofing superior to any other roofing system. The Two Ply Modified Bitumen Torch Down Rubber membrane is a superior roofing system than that of a Single Ply EPDM or TPO Roofing System. This roofing system can be installed almost over any surface including stone and other roofing membranes making it a very cost-effective roof that will outlast any other roof. 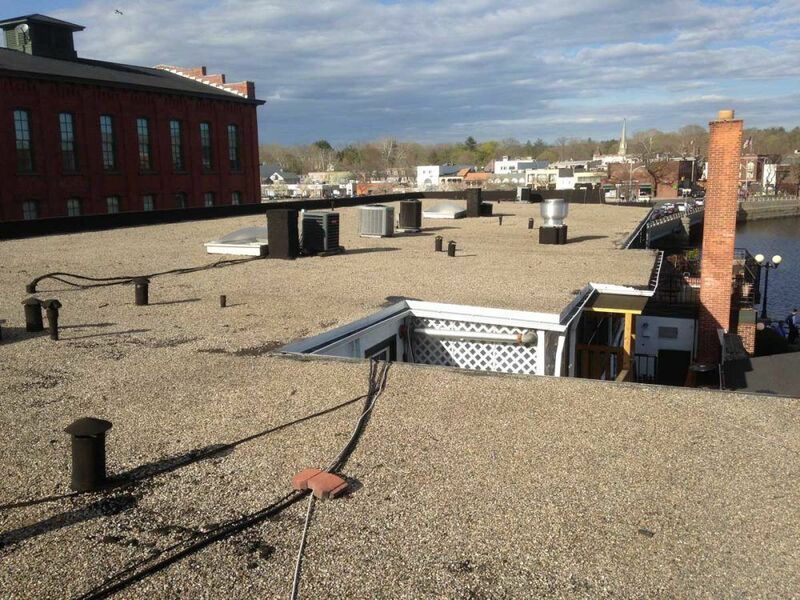 A 40-year warranty comes with the Two-Ply Rubber Roofs we install. We service all of Fairfield County, Connecticut, and Westchester County, New York. Remove unnecessary obstacles like unused vent pipes, left behind A/C units. When it comes to Roof Installation, the fewer obstacles on a roof, the less labor, and materials used the less the cost of the roof. 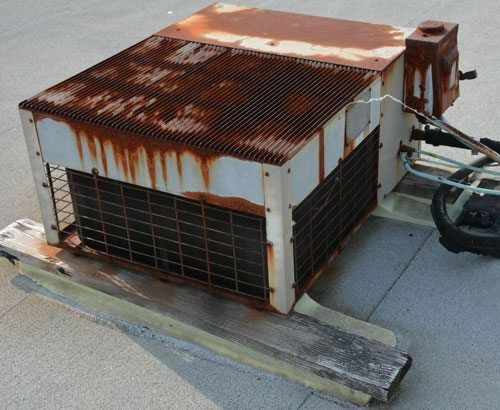 Remove old Air Conditioner units and old vent pipes as well as old roof vents. Thes roof vents are designed to remove dampness from inside the rafters. They are not always beneficial and by removing them will do no harm. 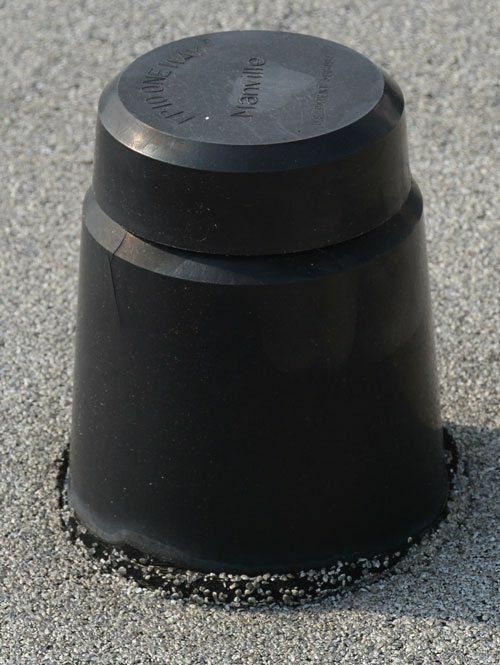 After raking the gravel making a smooth surface and removing clumps and larger rocks, install a fiber base paper by using long screws and anchor plates purchased from a roofing supply warehouse. Make sure the fiberglass paper is not wrinkled when anchored down spacing the anchors every 2 feet. Be careful not to cover the metal flashing and drip edges. 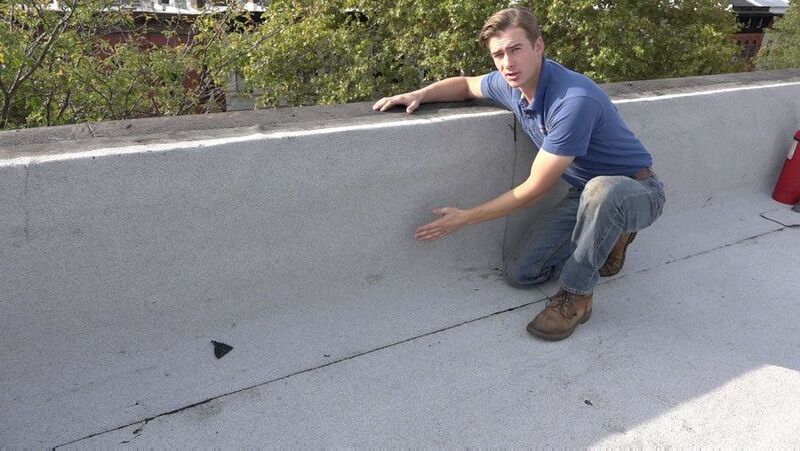 Install a Modified Bitumen Self-Adhering Base over the fiberglass base. Be careful not to include any metal parts. Torch Down a Modified Bitumen Rubber Membrane with ceramic granules embedded to the self-adhering membrane fusing them together. Use special adhesives to attach the Torch Down Rubber to the flashing and other metal areas. A Two-Ply Modified Bitumen Torch Down Rubber membrane was installed over this surface. As long as the big stones are removed and the gravel is raked evenly. Once the Two-ply Modified Bitumen Torch Down Rubber membrane is installed over the gravel, no one can tell by walking on it. It is super tough and no foot traffic or any workman will be able to damage it. If the surface has a pretty worn down coat of silver paint and flaking off, then sweep brush any loose paint and debris off the surface. Use a leave blower to get the dust off. Look for any wrinkles in the membrane and cut them away. 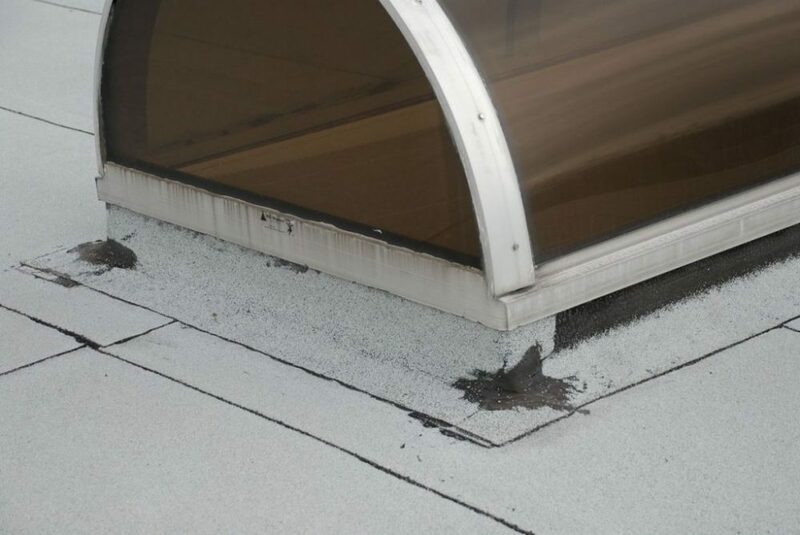 Remove the existing roofing membrane from existing flashing to expose the flashing around skylights, vents, walls and where necessary. 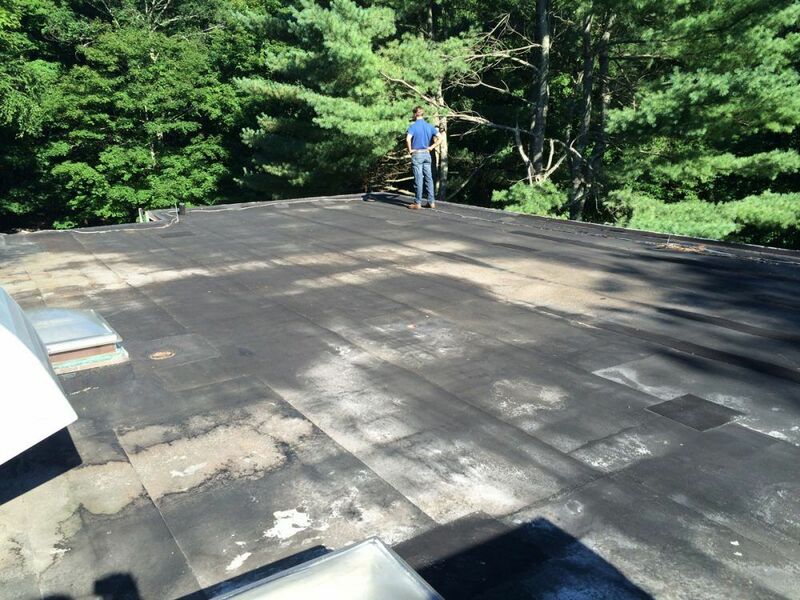 Fill areas where water would normally pond by installing an ISO board over the existing roofing membrane. 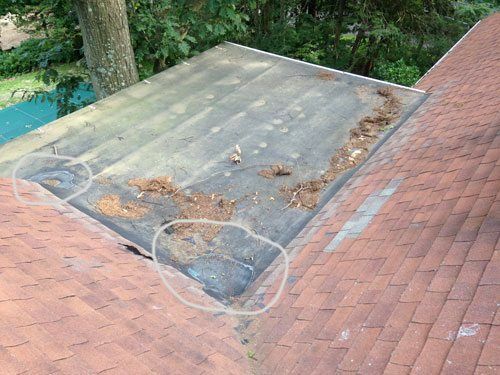 Lower areas around a drain area by removing roofing material. 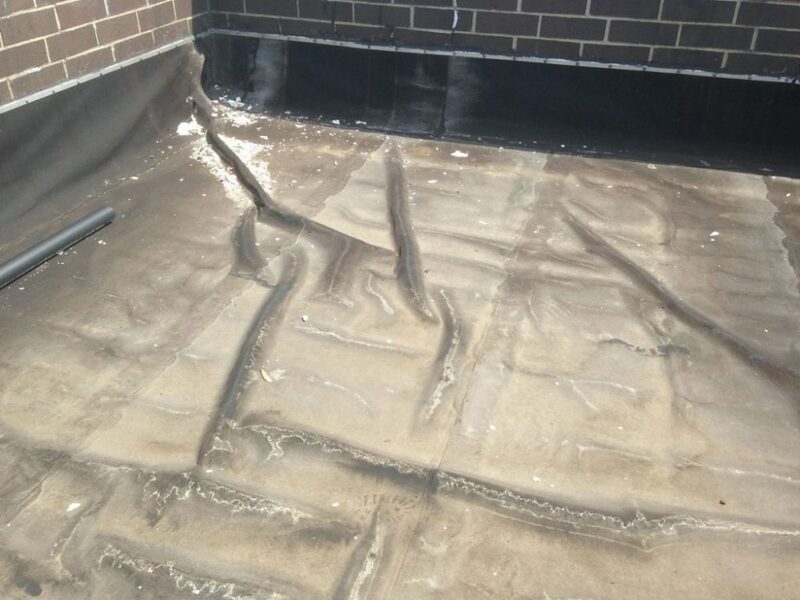 Install a self-adhering Modified Bitumen Base membrane in the areas where the surface had to be build up and where roofing material was removed to lower the roof. Torch Down a Modified Bitumen Rubber Membrane with ceramic granules embedded in the self-adhering membrane fusing them together. Use special adhesives to attach the RorchDown Rubber to the flashing and other metal areas. 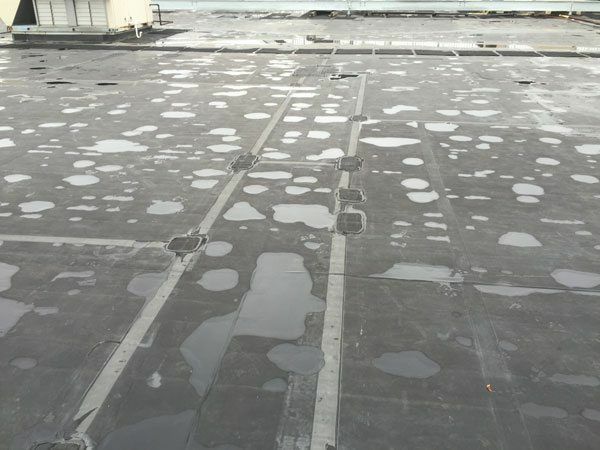 If the existing roof has a coating of Aluminum Asphalt (silver paint) but is mostly peeled off or 80% of the membrane is exposed, then it is advisable to install a membrane directly onto it with a torch fusing the new membrane with the existing rubber membrane. An Existing Modified Bitumen Torch Down Roof is ready for a new layer. Fusing the two together becomes an indestructible roof that will last beyond 40 years. If there is silver paint between the twp layers, then the two layers won’t be able to melt together. If the EPDM Rubber roof is still firmly attached to the substrate and not wrinkled, then screw down more anchor over the top of the rubber. 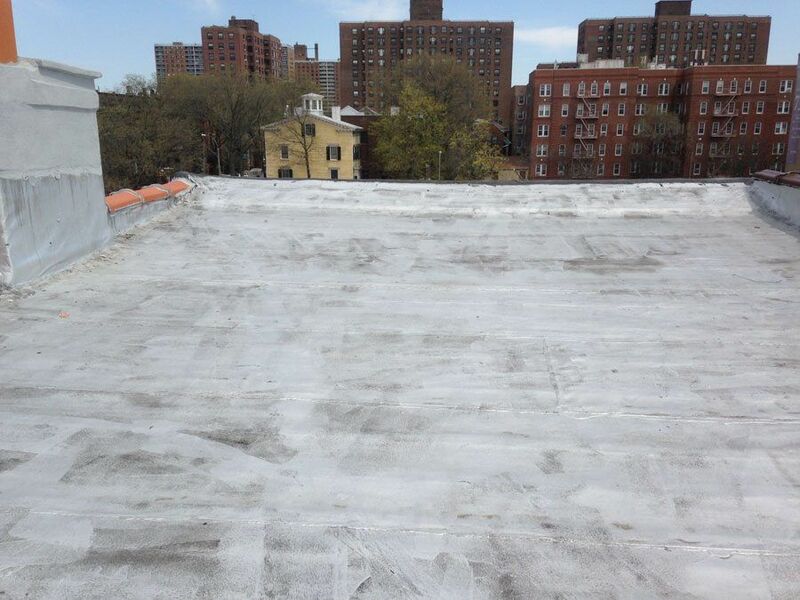 Remove the EPDM rubber from all flashing detail as in A/C units, skylights, vent pipes, parapet walls, drains, and siding. Clean and prepare the flashing and drip edges by removing adhesive with Laquer Thinners. Install new flashing where necessary. Cut away any wrinkled surfaces. 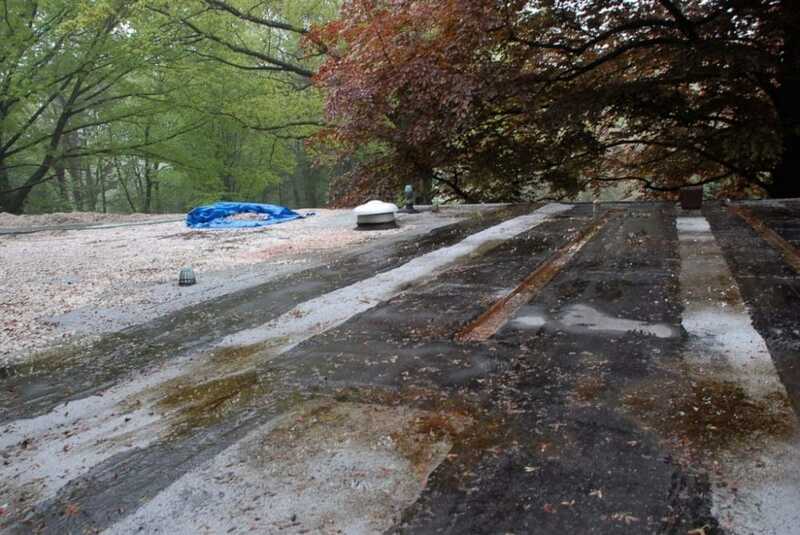 This EPDM Rubber Roof already had several patches. This is a perfect example of a roof that can be covered with a Two Ply Modified Bitumen Torch Down Rubber membrane. Install metal flashing where necessary. Once the Modified Bitumen Torch Down Rubber is fused to the Self Adhering base, it is time to take care of the details. 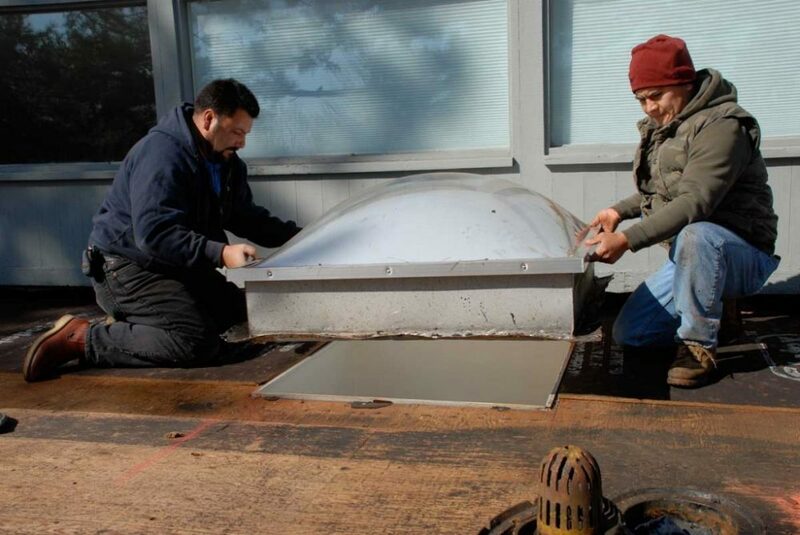 On every corner of skylights and a/c unit curbs and around every vent pipe, particular attention must be given to make the necessary patches. Use special adhesives to make necessary seals around skylights, A/C units, and vents, vent pipes, and pitch pockets. Attach the rubber membrane to the drain or scupper with special adhesives. 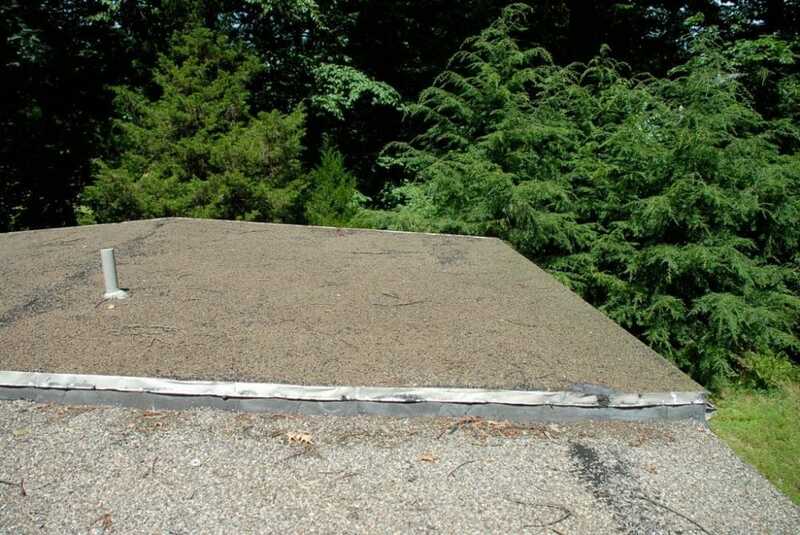 Use a leave blower to blow the roofing surface clean. Walk around to make a final inspection to see if all detail is taken care off.